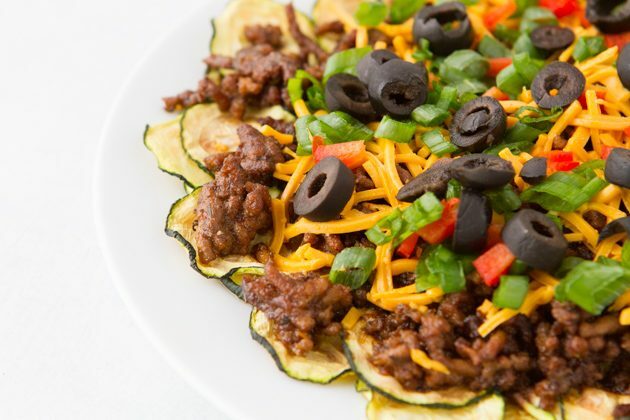 Disks of crisp zucchini slices topped with spicy beef, olives, green onions and dairy-free cheese. Made paleo-friendly without the cheese. Served alongside MCT guacamole enriched with Vital Proteins Collagen Peptides. This recipe is awesome to share with a pal or keep for yourself. You could make this low-carb recipe even more keto worthy by drizzling the whole thing with leftover bacon grease. If you’re in a keto household like ours, we always have high-quality bacon grease laying around. I don’t know what it is about nachos and bacon grease, but they just go together. 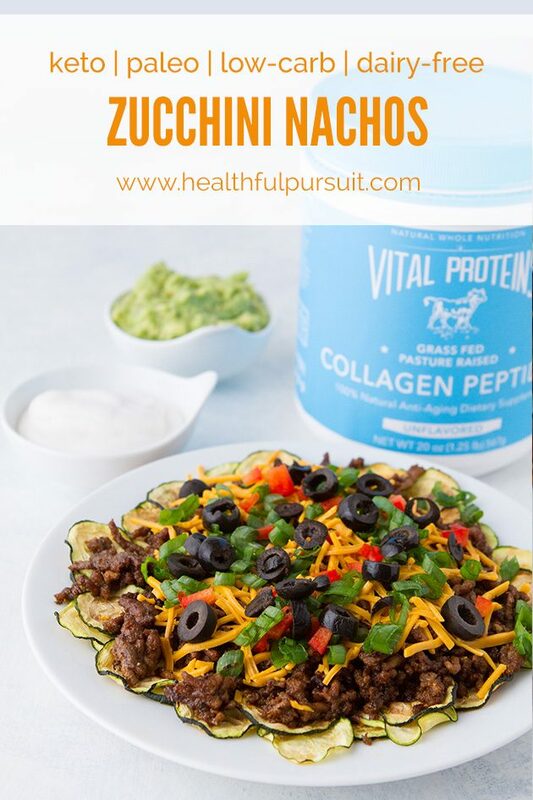 For the guacamole, because no plate of nachos is right without it, I added Vital Proteins Collagen Peptides into the mix to make the macros of this dish shine. 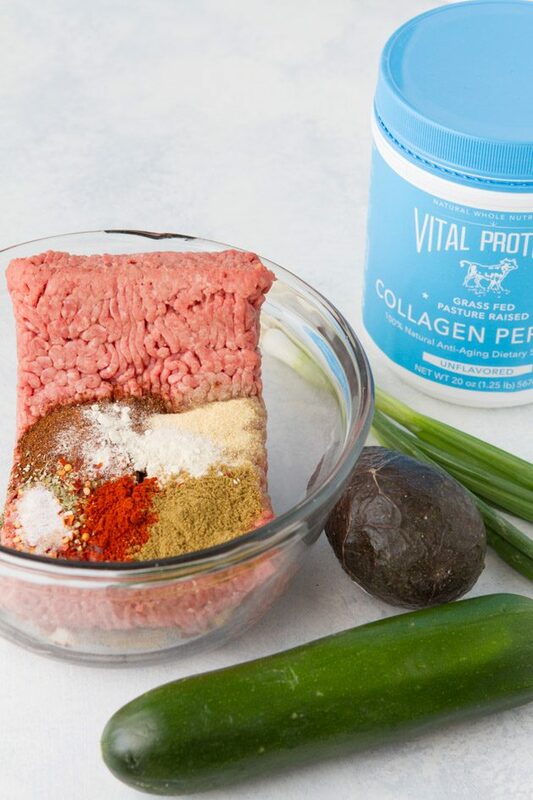 And also, I wanted to help y’all expand your collagen horizons by seeing that you truly can add it to just about everything from sauces to smoothies, dressings, dips, casseroles, and everything in between. You may be like, WAH, did she just use a microwave? Yes. Yes I did. You can oven bake the chips (425F/220C for 5 to 10 minutes on parchment paper-lined baking sheets) but the result is, well, bad. I wouldn’t recommend it. While I understand that microwaves may remove some nutrients, I don’t stress about it too much because I don’t use the microwave that often. I’d rather have crispy zucchini chips than no zucchini chips at all… or soggy ones because my oven doesn’t make them well. 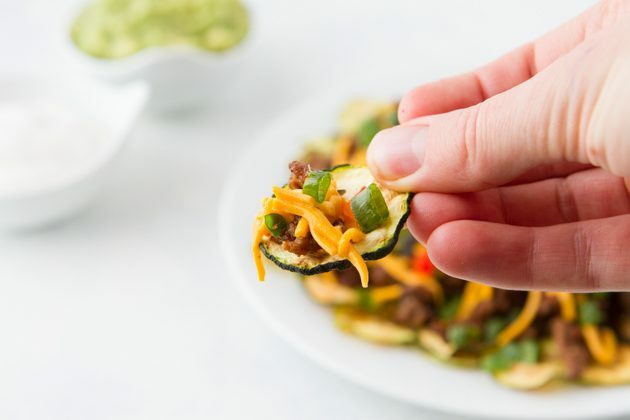 Disks of crisp zucchini slices topped with spicy beef, olives, green onions and dairy-free cheese. 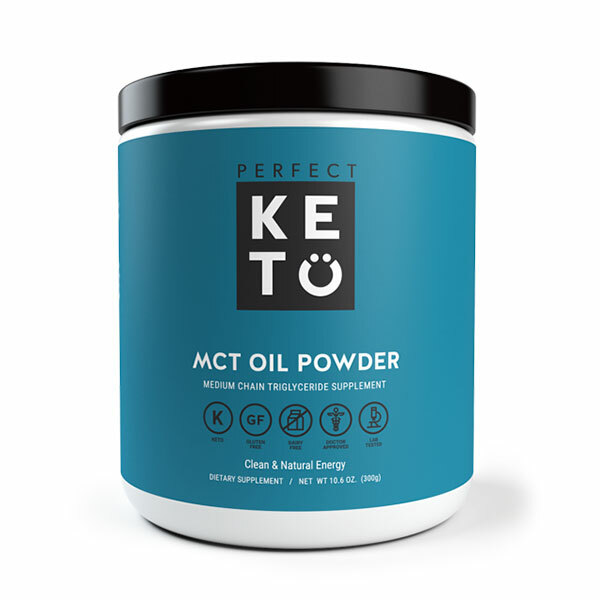 Served alongside MCT guacamole enriched with Vital Proteins Collagen Peptides. MACROS Fat 60% Carbs 10% Protein 30%. Line a large plate with parchment paper, placing each of the zucchini disks onto the paper being sure to not overlap. You will have to cook the zucchini in batches. Transfer the plate to the microwave and cook for 8 to 10 minutes on 50% power setting. You know the chips will be done with the edges curl and the middles get slightly golden. Once complete, remove the parchment paper from the microwave, flip over, and drop the chips onto a cooling rack. Repeat with remaining zucchini rounds. Meanwhile, place all the meat ingredients into a large frying pan. Heat on medium, rotating until the meat is no longer pink. Combine all of the MCT Guacamole ingredients together in a medium-sized bowl. Mash until combined. Transfer to a clean plate. Top with cooked meat, cheese, olives, and sliced green onions. Serve alongside MCT guacamole. Paleo: to keep the recipe paleo, remove the dairy-free cheese. And, check out more yummy keto dinner recipes collated by the guys at Happy Body Formula. 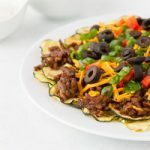 I’d love to know in the comments below, what else do you add to make extra-delicious keto-tastic nachos?